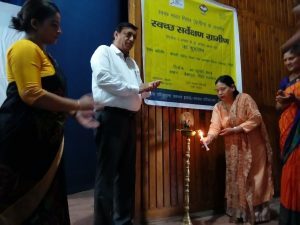 Under Government of India initiative Swachh Bharat Mission (Rural) ,a awareness chariot and rally by school children in the district under Cleanliness Survey Rural-2018 was flagged off by zila panchayat chairperson Deepti Rawat and district magistrate Sushil Kumar at collectorate premise.After this at Culture department auditorium a programme was held with traditional lighting of lamp. As per the charted programme Shri Guru Ram Rai,Girls Government Intermediate College,Messmore Inter College,Bharat Scout and Guide, Red Cross and other educational institutions school children along with officials with slogans,banners,placards carried out mass awareness drive covering Agency chowk,Mall Road,Bus Station,Dhara Road and finally gathered at collectorate premise again. 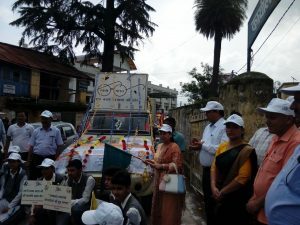 At the occasion zila panchayat chairperson Deepti Rawat and district magistrate Sushil Kumar also flagged off the cleanliness chariots to different blocsk.In her address at auditorium Deepti Rawat said that this is an important step under Swachh Bharat Mission towards cleanliness and we should take a leaf from school children too regarding cleanliness. 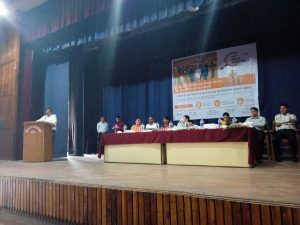 She said that seeing garbage on the stretches of a village she told children not to do so and at a major change is visible in such villages, where children adhered to her advice and are now safe from various diseases.DM Sushil Kumar shed light on Cleanliness Survey Rural-2018 saying previous years June month itself,Pauri Garhwal district has been declared ODF and toilets has been made at rural areas. He said that seminar and conventions will be held in the district headquarter regarding cleanliness and through meetings, online works also mass awareness will be brought. With coordination of zila panchayat at 160 villages garbage disposal and cleanliness development works are being done. At Neelkanth fair also in area of cleanliness, mass awareness is being brought and sought cooperation from all regarding this drive success. 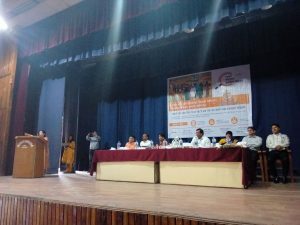 Chief development officer Deepti Singh shed light on objectives and parameters of the survey ,which will be held from 01 -31 August,2018.Data compilation will be made regarding cleanliness inspection at rural areas, toilet construction ,school ,anaganbadi centers cleanliness aspect and through direct and online mode views of rural people will be taken. At the occasion block chief Pauri Santoshi Rawat, project director SS Sharma, assistant project director Sunil Kumar, district education officer Hare Ram Yadav,program officer SK Tripathi, district panchayat raj officer MM Khan, Swajal manager Vijay Gairola and district level officials-personnel were present.